So what is the real secret behind the second-half success of Sox right-hander Jose Contreras? At least one major factor for the improved performance of Saturday night's Game 1 World Series starter is a more relaxed, flexible body resulting from extensive treatment from team massage therapist John Louis. "I thank God every day because [Louis] works on me every five days and it makes me feel loose," Contreras said through an interpreter. "In Cuba I didn't have that. I haven't gotten an injury. [Thank] God I gave that man a chance to massage me." Louis, who has been administering neuromuscular massage therapy on Contreras, also delves into acupuncture, deep-tissue massage and other techniques. The White Sox are one of just three major-league teams (the Dodgers and Yankees are the others) that employ a full-time massage therapist. Contreras established career highs this season in victories (15), starts (32), innings pitched (2042/3) and strikeouts (154). He was 11-2 with a 2.96 earned-run average in his 15 second-half starts, striking out 82 and walking 27. "I want to be careful not to take too much credit," Louis said. "But just keeping his tissue soft has been an important issue. I certainly believe it has played a role in his success." Louis, who has a clinic in Winnetka, also has worked extensively with Frank Thomas and Scott Podsednik, as well as occasionally with pitchers Orlando "El Duque" Hernandez, Freddy Garcia and Jon Garland. "When you play in this game, there is a lot of soreness and pain," said Thomas, out with a broken left ankle. "John Louis is a good guy and he has done a good job with us. It has been very important for me as far as relaxation. I had never thought about massage until the past couple of years. It adds a lot of flexibility and relaxation." Louis, 43, who grew up a Cubs fan in Palatine, said, "Now I have had to swear my allegiance to the White Sox." There will be a local sports presence at tonight's American Music Awards. Not an athlete, but rather an item in the celebrity gift bags. "The Massage Star: is a device developed by John Louis, the White Sox' massage therapist. "The Massage Star helps emulate exactly what massage therapists do with their hands," said Louis, founder and CEO of Acuforce. 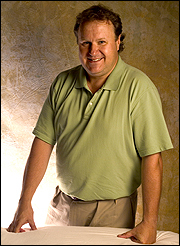 He also operates the Massage Therapy Center in Winnetka. "The [11-ounce] weight allows individuals to use the force needed to perform effective massages. Another unique feature is the coating we use, which is soft and durable, making it difficult to differentiate between the users' hands and the tool." "It's a terrific devise," Sox trainer Herm Schneider said. "The Massage Star is my favorite therapy product. It provides the weight necessary to perform techniques I use most, muscle stripping and trigger-point therapy, by targeting the exact points where treatment is necessary." 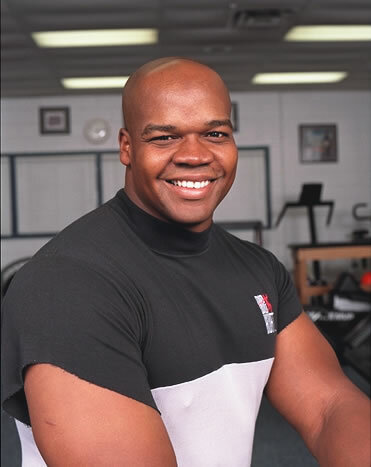 "I use it after workouts to target problem areas of my body when my muscles get tight," Sox two-time MVP Frank Thomas said. "I don't leave home without it!" No word on how the device is for massaging egos. 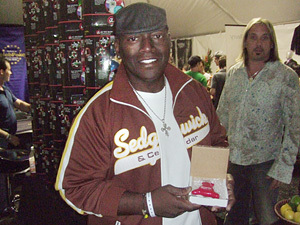 Randy Jackson, holding his brand new Massage Star.